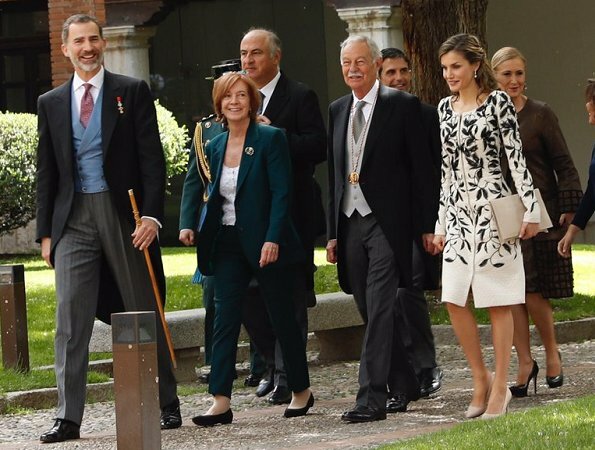 King Felipe and Queen Letizia attend the 2016 Cervantes Prize Literature Award ceremony at the University of Alcala de Henares on April 20, 2017 in near Madrid. 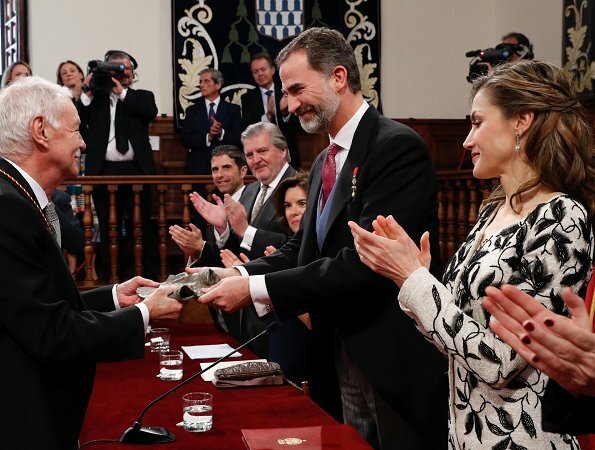 The prize is considered the most prestigious literary award for the Spanish language and named after 16th century writer Miguel de Cervantes. The award is 125,000 euro. Dress, shoes, handbag, everything looks lovely and elegant. But I've started to dislike her ever growing hair. Please Letizia return to the bob. Letizia´s best choices this week so far. I totally agree ...I almost fall out of my chair. I couldn´t agree more. Felipe is one good-looking man, and he knows how to dress. He is one of the few royal men who always look stately and polished, like old-school gentlemen. I can only think of Charles and Carl-Gustaf to come anywhere close with regard to dressing well, but they lack the charm, charisma and good looks of Felipe, so he really has no competition - my favourite by far. @ Vanessa, you are right about these three gentlemen. The younger generation does not seem to care, while I think it is not a big business to get your trousers shortened to the right length, any good gentlemen's outfitter offers this service, or to buy a jacket that actually fits, spend one or two thoughts on the right color of shoes, socks and ties. It's that easy! Hair is perfect. Queen Letizia looks young and energetic. Back on track and looking amazing. Her hair is great here! Lovely! Charming and elegant. Indeed back on track! The more I see this couple the more I think they leave the rest of the royals in the shade. They just always look so put together and very handsome couple. @Mimi, yes, both of them look always polished and regal, well put together, but good looks don't fall from heaven, it shows that they both make an effort when it comes to clothing, they are always dressed approbriate for the occasion and the people they meet, this is planned before and shows respect to the people and to their role, which I feel they take very serious. And I think they both have good counselors, stylists, tailors, hairdresser pp. at hand and, which is important, they listen to them! Whereas some royals just don't seem to care, which in my opinion shows little respect for their role. 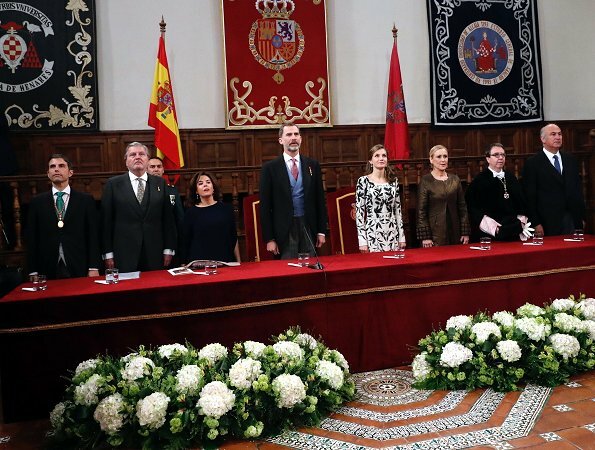 Also both Felipe and Letizia hold themselves great, you never see them leaning forward, crooked shoulders, round back,no matter how tiring it may be to stand for hours sometimes. I am sure they do some workout to stay fit and healthy ehich is also needed for their demanding job. Like the outfit but in a different pattern. Very nice, the sleeves are just a tiny bit too long but Letizia is still the best dressed royal. Kate always looks good but she just has no flair in her style. Catherine's problem is her really bad posture which ruins even her best outfits. Elegant royal couple. Tails good on King.